American Hickory dowels have to meet very strict quality characteristics to become a Vater drumstick. Vater only uses dowels that have a specific moisture content, straightness and grain structure, to produce a higher quality drumstick. 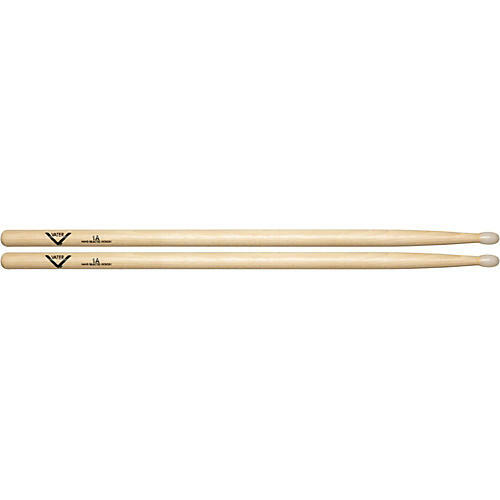 These Vater 1A Drumsticks are formed from hickory—the most popular drumstick material. Hickory is dense and strong so it is resistant to chipping and breaking. Stronger than maple, it also absorbs a lot of shock. As a result, these sticks lessen wrist and hand fatigue while playing. Vater guarantees their drumsticks to be straighter, more consistent and of higher quality than all other leading drumstick manufacturers. 100% of Vater’s drumsticks are manufactured in the USA. All Vater Drumsticks are tone and weight matched by computer analysis. Available with wood or nylon tips.